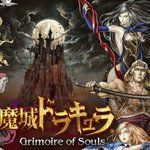 Japanese games developer Konami announced it will launch a brand new Castlevania game for iPhone - Grimoire of Souls. The upcoming game will star a new protagonist name Genya Arikado, a secret agent, who's accompanied by a mysterious magician, Lucy. It appears that Grimoire of Souls will be exclusively available on the iOS, but that won't come as a surprise. Konami launched another iOS exclusive game called Castlevania Puzzle: Encore of the Night some time ago.